This was a follow up to Azer's sick clinic visit last month. He hasn't had another asthma attack since then, and has been breathing fairly well seeing as we are deep in the heart of allergy season. He felt like his PFT's could have been higher, but that he is a little bit more mucusy than normal. Adding the extra half a can of formula to his night feeds has help. He gained two pounds in three weeks. 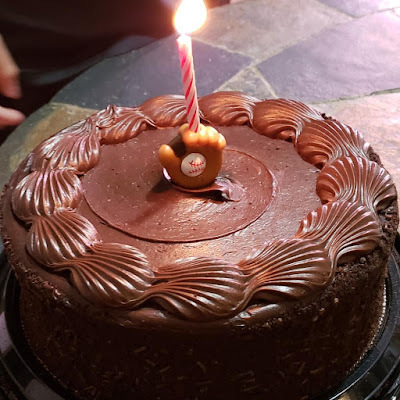 The dietitian and doctor gave Azer lots of good ideas on other ways to add calories to things he already enjoys eating, including some new snacks he might like to try. Time management has been difficult this school year, seeing as it's his first year of high school, and first year playing sports in school. I've always told Azer when he was little, because of the CF, you're going to have to work harder than others at everything you do. The social worker today basically said the same thing. Having CF is hard, and makes it harder to have extra time to do what you want. Azer is still learning about what works for him, what time of day works best for him doing treatments and homework, and how exhausting it can be getting to everything late everyday because of practice. He is so passionate about baseball, and we are all doing everything we can to help him continue to play! On Sunday, Azer was by himself watching a movie when suddenly, he was coughing non-stop and was struggling to breathe. He did an albuterol breathing treatment to see if it would stop. Unfortunately, he continued to cough for two full hours. He was exhausted by the time it started to get better. He coughed up the most mucus I've ever seen at a time. At the end, he coughed up some brown mucus. He said his upper airways hurt after this happened. The on-call doctor said to take him to the ER if another attack happened. Luckily, it hasn't happened again. He went to clinic yesterday to get a PFT and an X-ray to see if there were any significant changes. His lung function was down slightly, but within normal range, especially for it being allergy season. The doctor said his X-ray looked about the same from last time. The doctor wondered if the attack was a mucus plug coming up. Just to be safe, he will be on a course of oral antibiotics. In addition to possibly starting the new medication, he has to start doing an extra can of formula. The doctor warned him that people with CF tend to lose lung function along with weight. Azer had an early CF Clinic yesterday, followed by two games an hour away, so needless to say, he is pretty tired today! 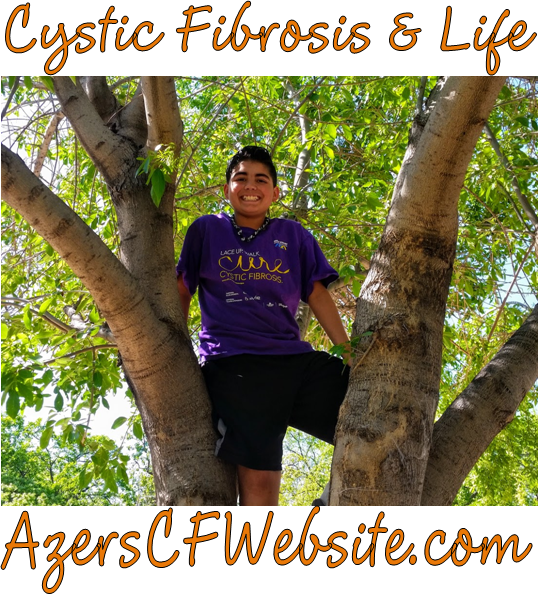 Azer lost a few pounds since his last CF appointment, and hasn't grown enough to see a change. The dietician came in to discuss what he eats and how to add calories without disrupting his G-tube feeds too much. He is eating snacks and his appetite has been pretty good lately. He packs his own lunches and fixes his own dinner since he knows what he is craving at the time. So, the only change is to increase the Liquigen added to his night feeds for a small increase in calories. 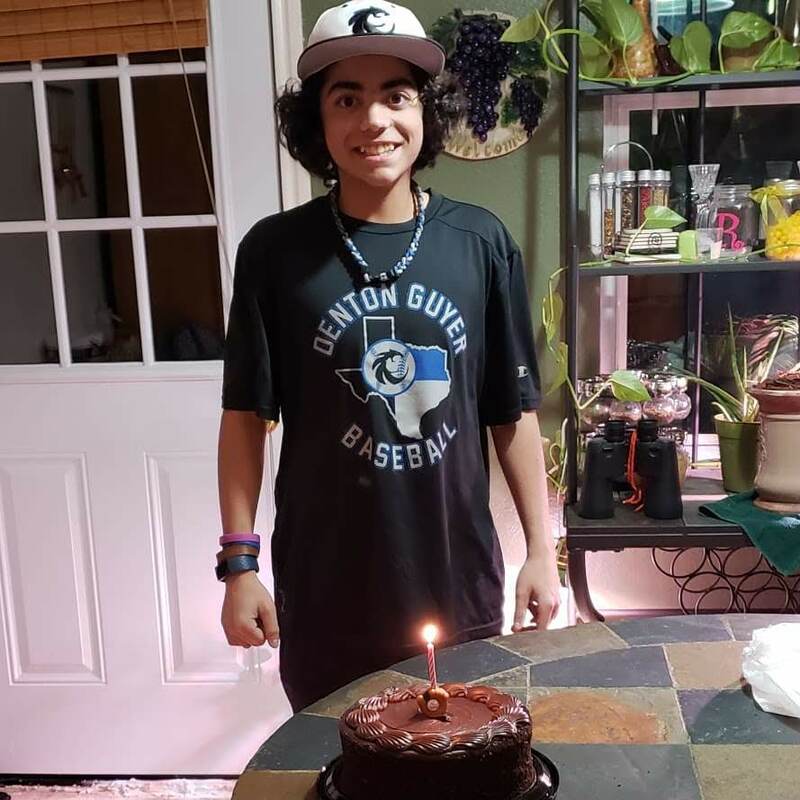 Since he has been lifting weights several times a week, and has had baseball practice nearly everyday, he has been burning quite a few more calories than usual. He has also been visibly putting on a lot of muscle. The dietician mentioned that sometimes the CFF focuses so much on the number of the BMI, without taking into consideration muscle mass and body fat. It would interesting to see the long term effect of a healthy BMI with the a measurement of muscle mass versus a higher BMI and a higher percentage of body fat. The doctor said to not worry too much about the growth just yet, as the Endocronologist looks at the long term trend. Azer's Fev1 looked pretty good today. His next CF appointment will be in only a few months instead of longer because of allergy season coming up. We discussed with the doctor that Azer hasn't been able to be consistent with his Periactin as sometimes he gets home too late to take it. If he takes it right before bed, he is so sleepy the next morning, he can barely function. Whenever he misses a few dosages of Periactin during allergy season, he gets so symptomatic, that he feels like he's getting a lung infection. One of the assistant doctors suggested a prescription allergy medication that is not an anti-histamine so it shouldn't make him drowsy. Hee can also take it with or without Periactin. About two weeks ago, Azer started to have a sinus headache. Nothing seems to touch it. One morning, during his breathing treatment, he started getting a nose bleed that lasted an hour. He tried to not blow his nose that day, but it started oozing again that night. The weird thing was after the nose bleed, he said he could smell a lot better, but that it was very sore. We let both ENT and his CF doctor know. Update: ENT said that the nose bleed was possibly caused by winter time dryness, and to use the antibiotic ointment to keep it moist. So far, Azer has been able to manage daily baseball practices in the evening, and doing his breathing treatments. We have helped him get his feed ready in the evenings to help him get to bed earlier. Last night was his first scrimmage. We bought him a special battery powered portable nebulizer. He was able to use this on the bus on the way back home and got his nebulized medicines done. 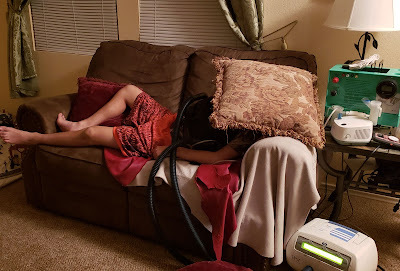 He said the nebulizer was easy to use and quiet. He didn't have time to do his vest last night, but at least he will be able to get the majority of his treatment done on late nights while away from home. Azer did a great job staying hydrated and packed lunch and dinner for himself, and when he got home late last night, he managed to get his growth hormones and the rest of his inhaled medications done. So, Azer's viral panel came back positive for the Coronavirus, which is basically one of thousands of cold causing viruses. His bacterial culture came back with only sensitive staph. The ENT clinic gave him some antibiotic ointment that he is to put in his nasal rinse everyday to help. 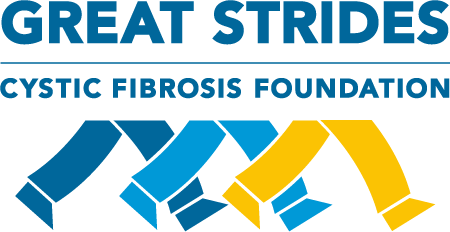 Today, he felt like his lungs just weren't recovering from this virus, so he contacted the CF clinic. The antibiotic that would cover everything he cultured from December would be Levoquin, but he doesn't want to deal with ongoing reflux from having to stop the Erythromycin. The doctor prescribed another antibiotic that will hopefully work. On top of battling this virus, and the bacteria in his lungs for the past week, Azer has had baseball tryouts for his High School freshman team. He has been working hard to get his treatments done, his PT stretches, lifting weights, sterilize his nebulizers, and try to maintain his weight. He felt like there was no way he would make the team. It was an emotional day when the coaches sat down with him and told him he has been selected to be one of the pitchers! Azer said he almost teared up when they told him he is inspiring and they want to keep him around. He keeps saying this whole team and the facility is like a dream come true. Anyone that knows Azer, knows he lives and breathes baseball. He has worked so hard to maintain his lung health and to keep his body strong, and it has paid off. He is so excited to spend nearly everyday on the field. It is going to take some planning and adjustment to schedules to get his treatments done and when he has late weekend games, but we are looking into a battery powered nebulizer. He has noticed he can't eat a big meal before practices, but is starving after, so it will take some practice to figure out when and how much he can eat. Azer isn't too worried about all this however. The main thing he is anxious about his that he required to get a haircut!!! When we had Azer's 504 meeting for High School this year, it was pretty much the same things it has been in the past: allowance for hydration and snacks, unlimited bathroom breaks, free pass to the nurses office... 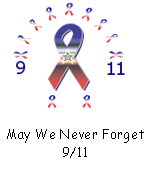 This year Azer attended the meeting and was able to bring up other issues that arose. We received some 504 suggestions from another family with an older child with CF that Azer really liked. We also addressed the possibility of him being hospitalized during baseball season, and wanted assurance that he wouldn't be penalized from missing practices or games do to doctor visits, or being ill. Azer is really taking charge of being an advocate for himself! An update on his CF culture: he cultured Stenotrophomonas, which we had the option of treating if Azer wasn't feeling much better. The problem with treating it is he has to come off of one of his GI motility medications, which causes bad reflux. So, he decided it wasn't worth it to treat right now. Today was a follow up with ENT. Azer's sense of smell has been great, and he hasn't experienced any loss until this past week, when he came down with some virus. The ENT doctor ran a virus panel to make sure this isn't caused by the flu. She scoped him, and while there weren't any visible polyps, he was pretty irritated and gunked up. They cleaned him out a bit. The doctor suggested that Azer add two packets of the salt mix to his nasal rinse, to help thin the secretions. She will ask our CF doctor about putting him on antibiotics, whether adding it to his nasal rinse routine, or orally. I will update when I hear about the virus panel and whether he will do antibiotics or not.